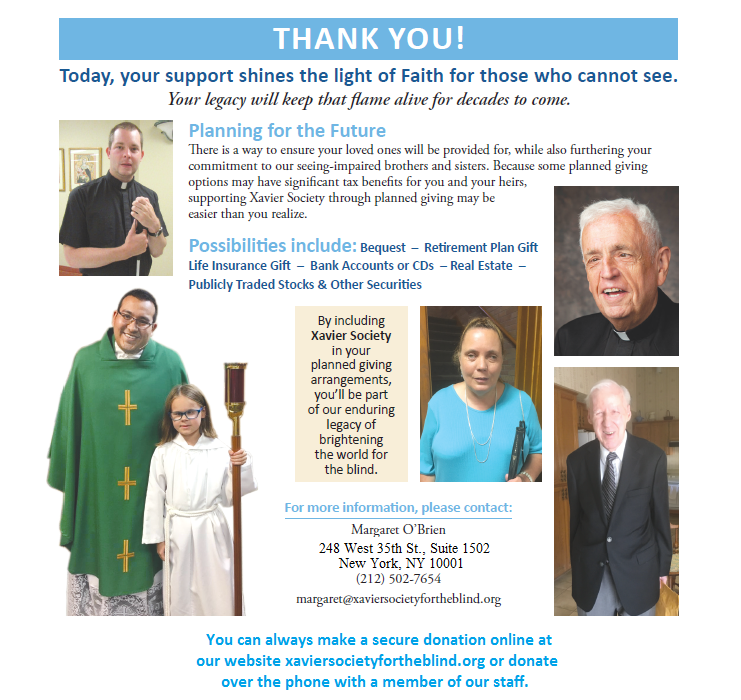 We are fortunate to have a group representing those we serve and those who have a strong interest in our mission, including educators, those involved in faith formation, those serving blind and visually impaired people, and of course, our patrons. At present, our Advisory Group consists of five accomplished and inspiring individuals who bring us a wealth of knowledge, experience, and passion for serving blind and visually impaired people. Profiles of these individuals are included herein. 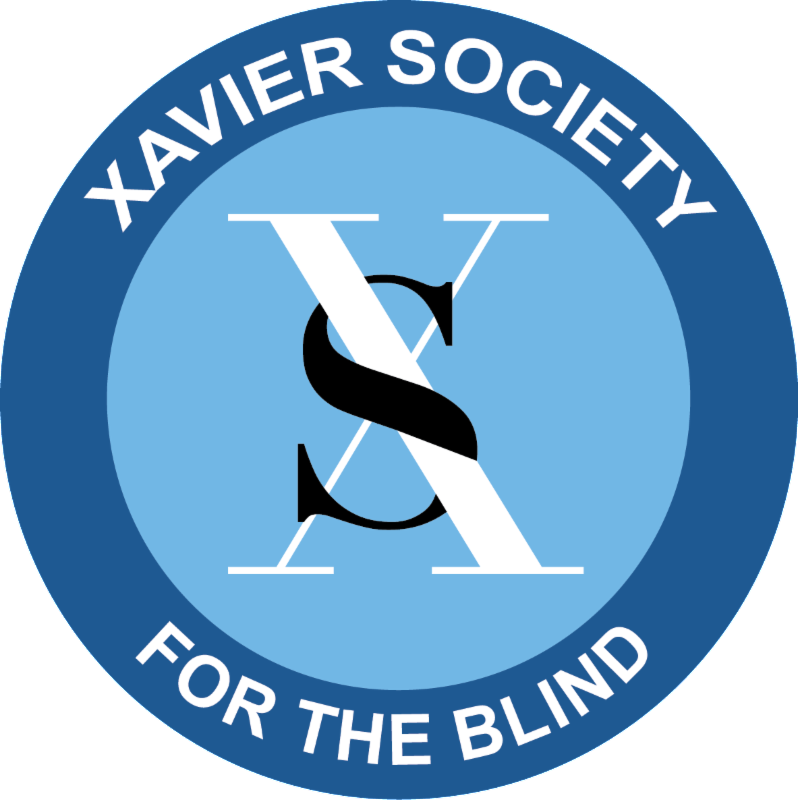 If you are interested in joining our Advisory Group please contact me at malachy@xaviersocietyfortheblind.org. Inés Chisholm is a patron of Xavier Society for the Blind, and is currently working on helping the organization expand its Spanish audiobook library. Mrs. Chisholm previously attended SAAVI Services for the Blind and holds a Ph.D. in Curriculum and Instruction in Bilingual Education from the University of Florida. A parishioner of St. James the Apostle in Coolidge, AZ, Inés is also RCIA director at her parish. 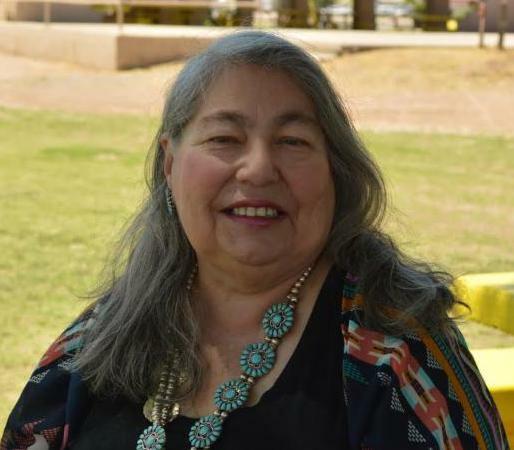 In addition, she is a certified Lay Ecclesial Minister in the Diocese of Tucson. Currently, Inés is attending Hesychia School for Spiritual Direction in Tucson to become a Spiritual Director using the Evocative Method. For more about Iné s, check out the Client Stories section of our website . Sharlene Kraft is also a patron of Xavier Society for the Blind. A graduate of Columbia School of Law and Loyola University, Sharlene was admitted to the Bar of the State of Illinois and the United States District Court for the Northern District of Illinois in 1995. Her extensive legal background and commitment to disability advocacy has brought her across the United States and to Australia in various positions and roles. Sharlene serves on the Paratransit Advisory Committee for MTA New York City Transit and on VISIONS/Services for the Blind and Visually Impaired Queens Advisory Board. She moderates the Book Discussion Group at the Andrew Heiskell Braille and Talking Book Library. A parishioner of Holy Family Roman Catholic Church in Flushing, Queens, Sharlene is also a lector and greeter at her parish. 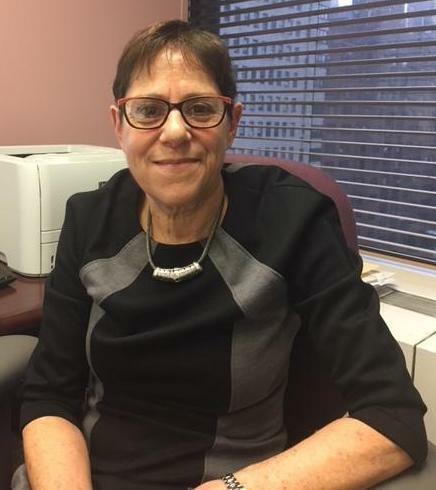 Judith Katzen is Director of Catholic Charities Community Services, Catholic Guild for the Blind in New York City. Catholic Guild for the Blind provides social services for individuals of all faiths who are blind or legally blind. Judith also serves on the Board of Directors of New York State Vision Rehabilitation Association. Ms. Katzen holds a Masters Degree in Social Work Administration from Virginia Commonwealth University. Cindi Swanson is a resource/information specialist with the Arc of Illinois, an organization committed to empowering persons with developmental disabilities to achieve full participation in community life through informed choices. Before joining the Arc of Illinois, Cindi was a school social worker at All Saints Catholic Academy in Naperville, IL. An advocate for people with disabilities on a local and state level, Cindi served for 6 years on the Board of National Catholic Partnership on Disability. Cindi served 8 years as disability minister for Holy Spirit Catholic Community and 3 years as disability minister for Our Saviour’s Lutheran Church, both in Naperville. Rounding out our group is Shelly Gray, who also happens to be a braille patron of Xavier Society for the Blind. An R.C.I.A. teacher for over 20 years, Shelly instructs pupils at St. Elizabeth Ann’s Church in Omaha, NE, where she is also a parishioner. 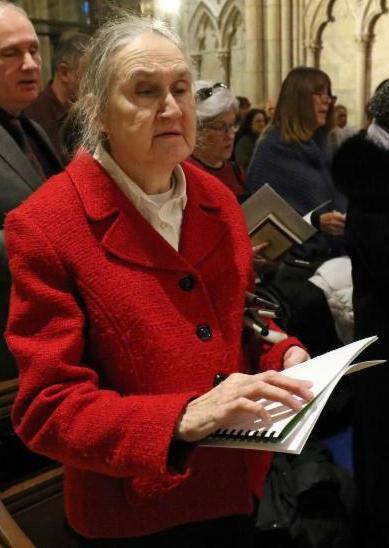 She is a professed Franciscan, and is involved with liturgies, retreats, and other special services such as penance and healing services at her parish. Xavier Society for the Blind looks forward to working with the Advisory Group in the near future. We would like to remind our patrons that in conjunction with Fordham University, the Jesuit University of New York, our audiobook library has various contemporary lectures for our patrons in our circulating library and on our website to download. This month we have added two new lectures to our audio library (please see Hot Off The Press Section below for complete summaries). Francis@Five: Assessing the Legacy of Pope Francis Five Years After His Election has been generating a lot of attention in particular. Many thanks to Fordham University's Center for Religion and Culture (C.R.C.) for its cooperation! To stream these lectures with video please follow this link . If you would like to request any of these, please get in contact with us! 1. Daily Gospel Meditations for Lent: The Christian Dilemma (B1171, 1 volume) by Fr. Isaias Powers, C.P. 3. Words at the Wedding: Reflections on Making and Keeping "The Promise" (B1219, 2 volumes) by Fr. William J. Byron, S.J. 4. In Garments All Red: The Life Story of St. Maria Goretti (B1261, 1 volume) by Godfrey Poage, C.P. 2. Picking Popes: Conclaves (D0933) by Professor Christopher Bellitto, Ph.D.
10. The History of the Mass (D9185) by John F. Baldovin, S.J. - Down Gospel Byways: Eighteen Stories of People Who Met Jesus by Mary Tense Dome (B1605, 1 volume): Vignettes and stories of people who have met Jesus. - How Much is Enough? (B1606, 3 volumes): Arthur Simon takes an uncompromising look at America's wealth, reflecting what dominates the hearts and motivations of its people. - Principles, Prophecy and a Pastoral Response: An Overview of Modern Catholic Social Teaching by U.S.C.C.B. (B1607, 1 volumes): An overview of Catholic social teaching that provides reflection questions, scripture references, descriptions of publications by the Vatican, and descriptions of documents promulgated by the U.S. bishops related to Catholic social teaching. - Resisting Happiness by Matthew Kelly (B1608, 2 volumes): Ordinary people and the finest philosophers have been exploring the question of happiness for thousands of years, and theories abound. But this is not a book of theory. Resisting Happiness is a deeply personal, disarmingly transparent look at why we sabotage our own happiness and what to do about it. - The Maronites and Their Saints by Sister Maria Philomena (B1609, 1 volume): Short biographies of Maronite saints. - The Rush to Resurrection by Donald X. Burt (B1610, 2 volumes): Uplifting book for Lent with prayers and devotional literature. - Imperfect Union: Has America Lost its Moral Center? by Fordham University Center on Religion and Culture (D1208): We find ourselves living in a world where foundational principles such as equality, tolerance, and free speech seem increasingly fragile - a world where the very concept of truth appears to be under siege. Is this turmoil symptomatic of a deeper, looming moral crisis in America? - Francis@Five: Assessing the Legacy of Pope Francis Five Years After His Election by Fordham University Center on Religion and Culture (D1209): A leading Catholic theologian and a leading Catholic journalist engage in a public debate over the impact of Pope Francis' controversial pontificate. Next month we prepare for the Resurrection as Lent comes to an end and we also celebrate the Solemnity of Saint Joseph, spouse of the Blessed Virgin Mary and the Memorials of St. Katherine Drexel and St. Patrick. Here are some books for these and other special occasions! - Daily Gospel Meditations for Lent: The Christian Dilemma by Father Isaias Powers, C.P. (B1171, 1 volume): Useful guide on how to implement the words of the Gospels into daily Lenten meditations. - Saint Katherine Drexel, Friend of the Oppressed by Ellen Tarry (B1222, 2 volumes): Biography of Sister Katherine Drexel, foundress of the Sisters of the Blessed Sacrament, known for her work with African and Native Americans. - St. Patrick, His Confession and Other Works by St. Patrick and Father Neil Xavier O'Donoghue (B1302, 2 volumes): Discover St. Patrick's relevance for the 21st century, though his own words, prayers, a discourse by Pope Saint John Paul II, and a newly composed novena. - Christian Prayer: Passion (Palm) Sunday, the Easter Triduum, and Easter Sunday (B6005, 1 volume): Christian prayers for Palm Sunday, the Easter Triduum, and Easter Sunday. - Novena to St. Joseph by E.W.T.N. (B1466, 1 volume): A novena to St. Joseph, with nine themes contained in a booklet. - St. Joseph's Catholic Manual by Rev. Thomas J. Donaghy (B1588, 3 volumes) : A handy digest of principal beliefs, popular prayers and major practices with complete references to the Catechism of the Catholic Church. - Easter Vigil and Other Poems by Karol Wojtyla (Pope John Paul II) (D0113): Written by John Paul II while he was a parish priest and auxiliary bishop of Krakow. - The Trials of St. Patrick by Augustine Institute Radio Theatre (D1186):The epic story of Ireland's patron Saint and his spiritual odyssey through hardship and loss, mercy and forgiveness. Dramatized with a fresh boldness by Augustine Institute Radio Theatre. - Jesus of Nazareth: Holy Week, From the Entrance Into Jerusalem to the Resurrection by Joseph Ratzinger (Pope Benedict XVI) (D0936): Holy Week from the entrance into Jerusalem to the Resurrection, written by Pope Benedict XVI. - Katherine Drexel by Ellen Tarry (D0217; can also be downloaded from our website): The story of a n heiress who spent her fortune to help the poor. - The Life of Christ by Archbishop Fulton J. Sheen (D1162): Filled with compassion and brilliant scholarship, Fulton Sheen's recounting of the Birth, Life, Crucifixion, and Resurrection of Christ is as dramatic and moving as the subject Himself. - St. Patrick, His Confession and Other Works by St. Patrick and Father Neil Xavier O'Donoghue (D0974): Discover St. Patrick's relevance for the 21st century, though his own words, prayers, a discourse by Pope Saint John Paul II, and a newly composed novena. - Finding Jesus: Living through Lent with John's Gospel by Gerald O'Collins, S.J. (D0153; also available for download): Meditations from the Gospel of John for the Lenten Season. - Lent with the Saints: Daily Reflections by Greg Firedman, O.F.M. (D0925): Daily Lenten reflections connected with the story of various saints. - Lent, Holy Week, and Easter by Fr. John F. Baldovin (D0981): Father Baldovin explains the liturgical seasons and their vital importance to Catholics. At the moment we are currently overhauling our donor management system so our supporters can donate more easily online. If you wish to donate, please call our office at (212) 473-7800 or (800) 637-9193. Our Coordinator of Communications and Fundraising, Aisling Redican, will be happy to assist you.